It has been a year since Kingdom Hearts. 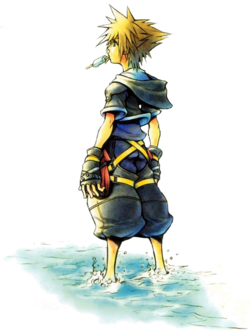 After battling the Nobodies of Castle Oblivion in Kingdom Hearts: Chain of Memories, Sora fell into a deep sleep in order to have his memories restored. Meanwhile, in Twilight Town, Roxas is enjoying the remaining days of his summer vacation, all while questioning the mysterious happenings of the town that it seems only he can see. 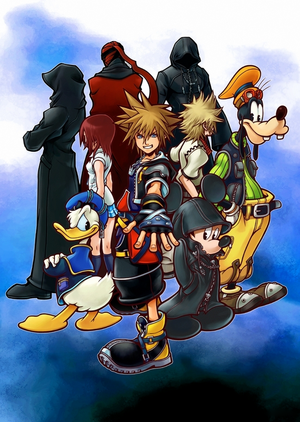 Kingdom Hearts II is very similar in structure to the first game, albeit refined. Use the Gummi Ship to travel between worlds representative of (and heavily stylized after) classic Disney movies, from Mulan to The Lion King to Beauty and the Beast. Contrary to the previous game, worlds will often need to be revisited; both first and second visits (and possibly third visits) of a world are consolidated onto one page, with links to recommended next worlds at the bottom of each visit. Lastly, the difficulty you choose doesn't matter as much as one would think, as the game is incredibly balanced. As an example, Critical has a much smaller HP cap for Sora, but he also deals much more damage. The difficulty goes both ways, as optional bosses are made to be as challenging on Beginner as they are on Critical. The game is also entirely beatable with a Level 1 cap (using the No Experience ability) on Critical; this includes optional bosses. Choose wisely, but also remember that no matter the difficulty you choose, the thrill of battle will always be close by. You will begin by playing as Roxas, in the midst of the final days of his summer vacation; only seven days to go. This page was last edited on 29 September 2017, at 04:49.